As we at Glitch Free Gaming are predominately video gamers, we tend to notice things that board gamers are more used to and take for granted. The whole designer / publisher relationship is one of these things. In most cases a designer licences the game to the publisher who can then print and release as many copies as they wish for a certain period of time. You will also often find that once a licence period finishes, the game will go to different publisher who may sell to a different market or produce the game with better quality materials. This is not seen as scandalous or cause for the internet to explode, it’s normally seen as an opportunity to acquire the game if you previously missed out on it. This is the case with Hera & Zeus . Originally published in 2000 by Kosmos and in English by Rio Grande Games the game was received and sold well. 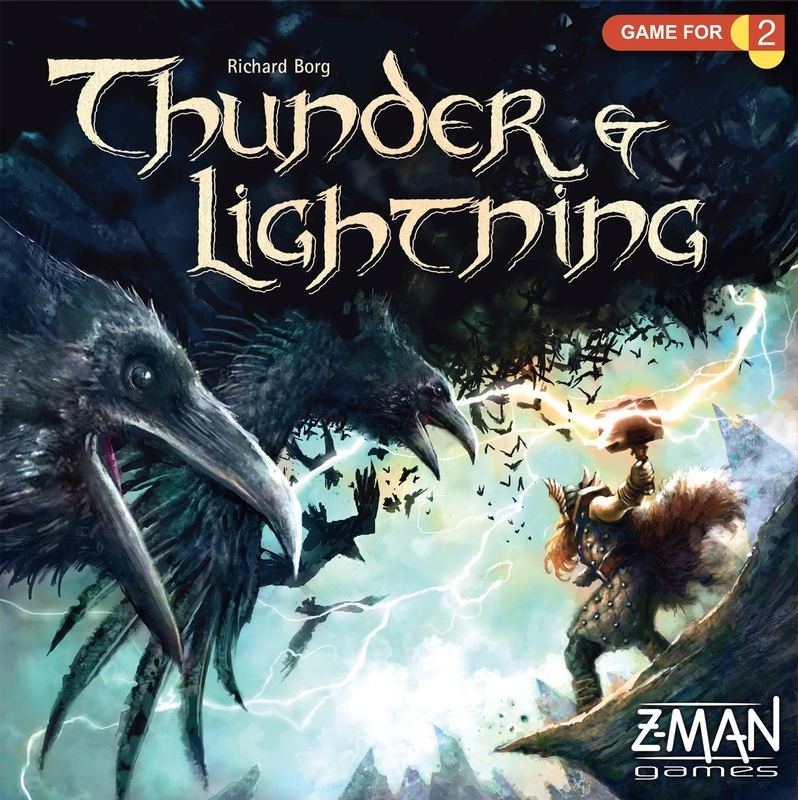 Cut to sixteen years later, designer Richard Borg has tweaked things around, changed the artwork and theme and Z-man games have now released Hera and Zeus re-implemented as Thunder & Lightning. Thunder & Lightning is a two player card game set in Norse Mythology which sees Thor and his armies battling Loki and his. The game is played with two fifty card decks. 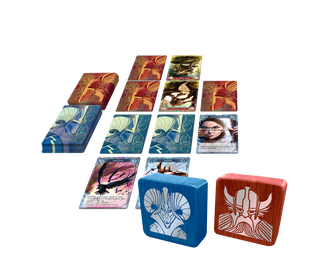 Each deck represents either Thor or Loki’s armies and consists of cards that are used for combat, cards used for their effects (called mythological cards) and cards capable of one or the other. And whilst each deck has different armies -Thor has rock trolls; Loki has ice giants, they are balanced so that each deck has the same number of combat and mythological cards. 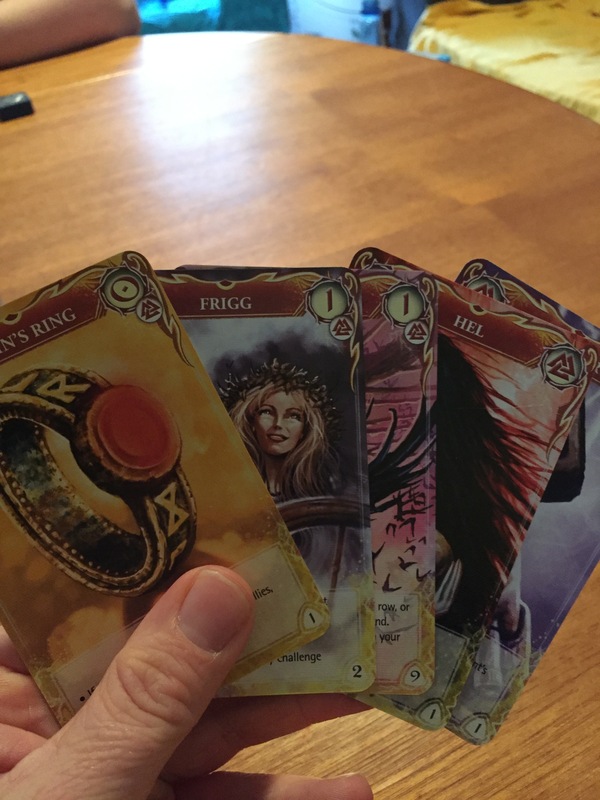 The decks also have a treasure card; Odin’s crown in the Loki deck and Odin’s ring in the Thor deck. These cards are the main objective of the game with whoever managing to reveal one of the cards winning the game. For those familiar with Hera and Zeus, you may be wondering what the differences between it and Thunder and Lightning are. As I never played Hera and Zeus, a quick scour of the internet net has revealed a few things. The card count has increased the size of each deck from 43 to 50 cards each; The abilities of the cards are now on the cards themselves rather than a reference sheet and; each card now has an indicator in the bottom right corner to tell you how many copies of that card are in your deck. There is also the switch from Greek mythology to Norse mythology in the theme. Personally, I prefer the Norse mythology and the artwork in this version. As bright and pretty as the art in the original was, it romanticises all the Greek Gods. Thunder and Lightning on the other hand delivers gorgeous and sharp imagery that portrays the characters as gritty and real. 3. Play a mythological card from your hand to gain its effect. 4. Challenge a card in your opponent’s front row. The card with the highest strength value stays on the field and the loser gets discarded. The game continues until either one of the treasure cards gets challenged or revealed from a players hand. The game can also be won if your opponent cannot use all of their actions in a turn or if they have no card on their battlefield at the beginning of their turn. The gameplay in Thunder and Lightning is top notch. We love the way the whole battlefield system works. And whilst every player will always have a preferred strategy, it may not always be in operation due to the opening hand they were dealt. It is this not knowing what your tools are that makes every game unpredictable and what essentially puts Thunder & Lightning above other two player strategy classics like Stratego and even Chess. We also love that Thunder and Lightning takes certain staples in card gameplay and flips them. The player hand is a good example of this. As the object of the game is to find the relevant treasure card, normal board game conventions would say that if you had the treasure card your opponent is looking for in your hand; it would be pretty safe. There are certain cards in the game can cause you to lose a card from your hand (the Nightmare card can get you to discard your entire hand) and if that card is the treasure card – game over. It’s a small but brilliant thing as you have something else to consider when building your strategy for the game. You are constantly at odds with yourself trying to decide whether to keep the treasure card in your hand for one more turn or whether to place it in your battlefield and guard the hell out of it. Quality wise, Z-man games have kept Thunder and Lightning to the same high standard you would expect from their products. The cards are of the same quality as you get in games such as Pandemic. The game also comes with two wee wooden blocks – a red and a blue one – with one depicting Thor’s head and the other Loki’s. They do not serve any purpose as far as I can tell but they are gorgeous nonetheless. The only negative we could find about Thunder and Lightning has nothing to do with the game itself and is probably subjective. The RRP of £27.99 seems to be on the steep side (by about £5). 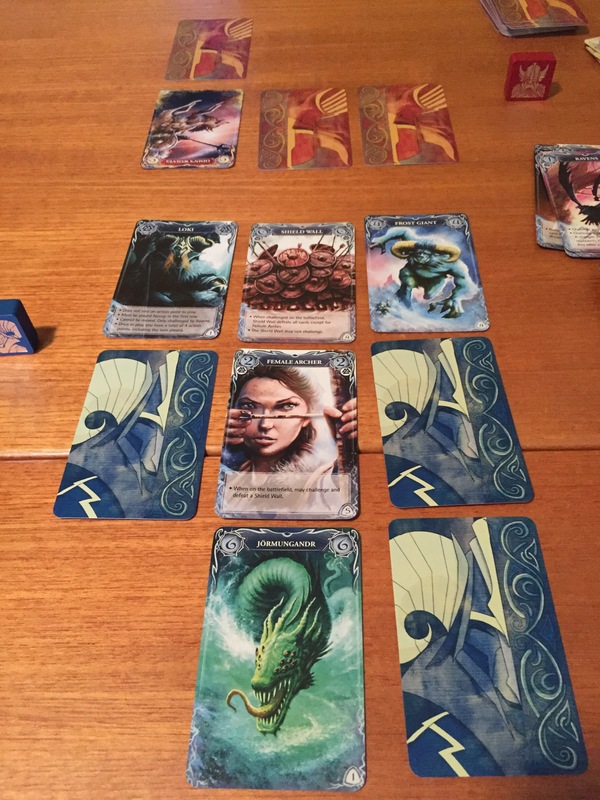 Although the game is comparable in price to other card games such as Netrunner, Game of Thrones and Sentinels of the Multiverse; these games come with card counts well in excess of the one hundred that Thunder & Lightning does. So, while we feel obliged to mention our thoughts on the price of the game, we also feel obliged to say should you take the plunge; you will get your money’s worth from the repeated plays of Thunder & Lightning. The easy access and depth of strategy in Thunder in Lightning is making it one of my favourite 2 player games ever. Matches I have had have ranged from five to fifty minutes and have not once failed to surprise and entertain. The game feels like the perfect combination between Chess, Stratego and Magic the Gathering so if any of those are among your favourites; then Thunder & Lightning needs to be on your priority list.